During the last century, blackbuck range and numbers have declined sharply due to excessive hunting. 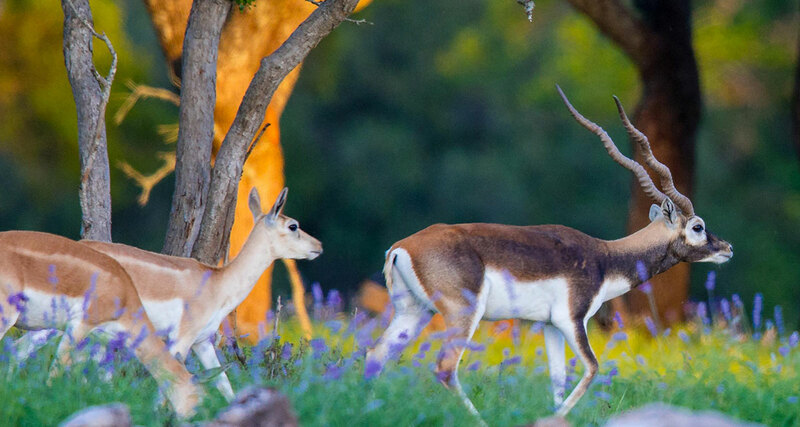 Increasing numbers of livestock and humans destroy blackbuck habitat. Some blackbucks are killed illegally especially where they co-occur with nilgai. Blackbucks are hunted for their flesh and skin. Occasional incidents of poaching still occur. The remaining populations are under threat from inbreeding. The natural habitat of the blackbuck is being encroached upon by local people who need arable land and grazing ground for their livestock. Exposure to livestock also exposes them to bovine diseases. Its protected status has gained publicity through a widely reported court case, in which one of India’s leading film stars, Salman Khan, was sentenced to five years imprisonment for killing two blackbucks and several endangered chinkaras, in a protected area. The court case was prompted by intense protests from the Bishnoi ethnic group, which holds animals and trees sacred, and on whose land the hunting had taken place. In another poaching incident, Mansoor Ali Khan Pataudi also killed a blackbuck, and then absconded as a fugitive. He finally surrendered only when the case was transferred from the criminal court to a special environment court, where he would face lighter sentencing. Until the late 19th century, large herds still roamed on the open plains of North India. William Thomas Blanford knew of herds comprising several thousand individuals, but more often herds numbered 10–50 blackbucks. Until India’s independence in 1947, blackbucks and chinkaras were hunted in many princely states with specially trained captive Asiatic cheetahs. Today, only small herds are seen, largely inside reserves. Farmers of the expanding areas of cultivation considered blackbucks as crop-raiders, and further contributed to their decline. In the 1970s, blackbucks were extinct in several areas. In India, hunting of blackbucks is prohibited under the Wildlife Protection Act of 1972. Blackbucks can be seen in zoos.